Happy Tuesday, my scrappy friends! 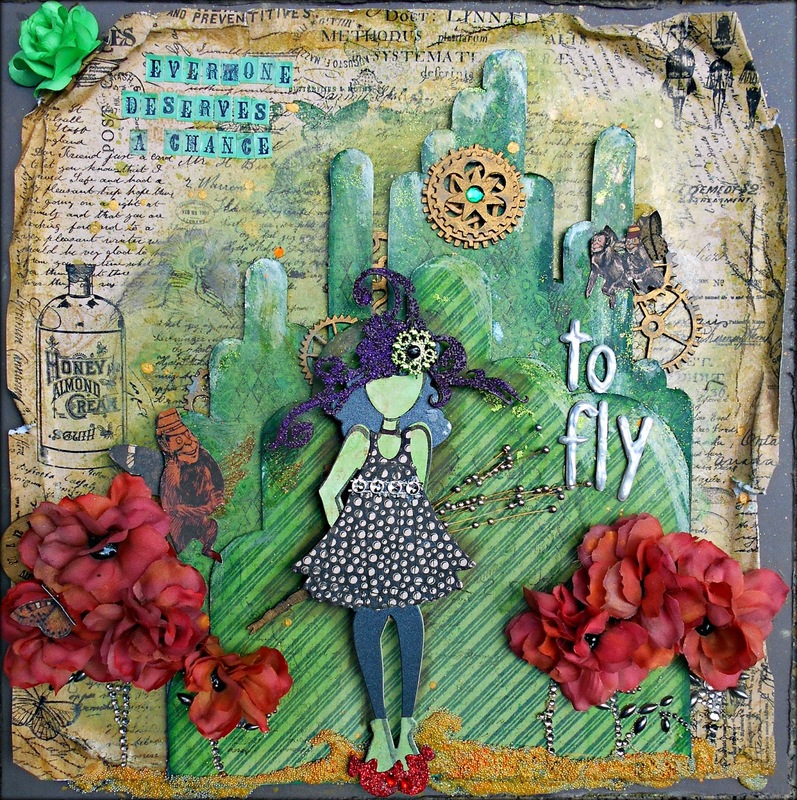 Today I want to share with you a mixed media page created with Leaky Shed Studio chipboard and products from Altered Pages. The Graphic 45 and cardstock are from the Altered Pages Store. 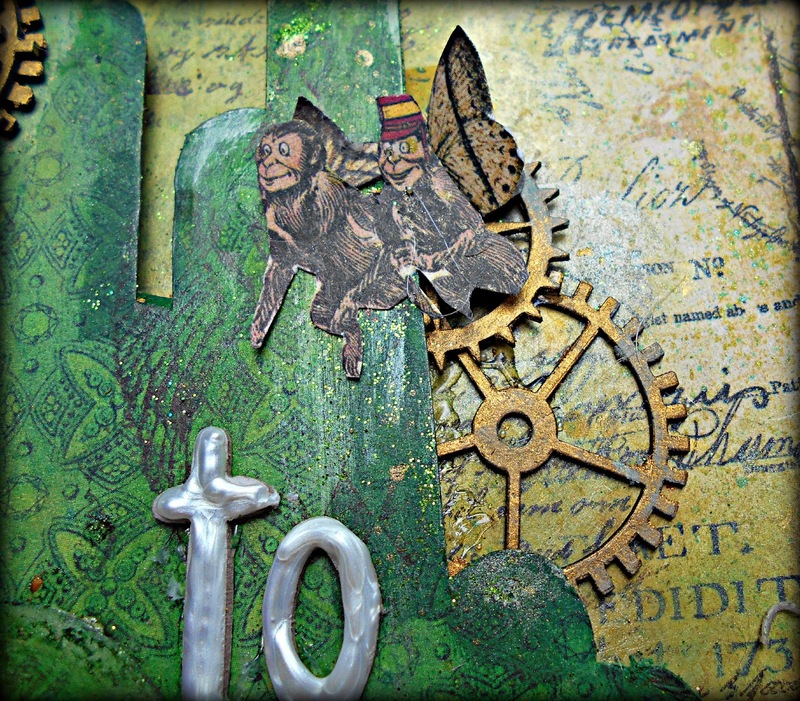 All the wings on my Flying Monkeys are a combination of stamped and fussy cut images also from their store. 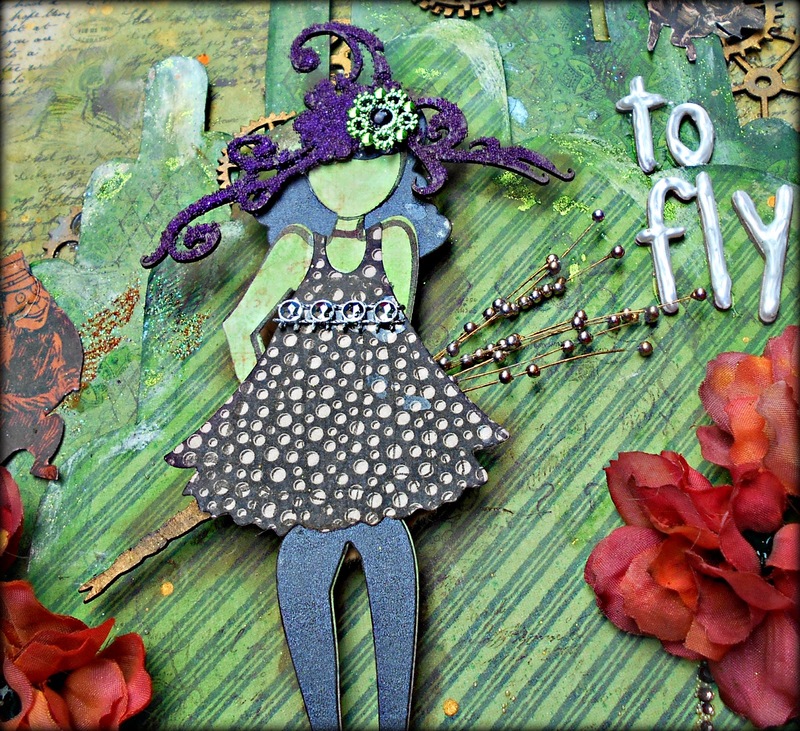 The Theme of our projects is "Fly",so when I saw the gorgeous Emerald City pieces, Elphaba immediately came to mind! "Wicked" is one of my daughter's and my favorite musicals. She assisted me with the creation of the paper doll. The Emerald City chippies are actually part of an album but if you think outside the box,you can much more mileage from the same pieces! I started my background with a mix of greens and gold gelatos,blended with a moist paper towel. I then stamped random images using the Muse on a Wing stamp set. The watch part LSS chippies were antiqued using gold Rub n' Buff and smudged with black distress ink. They add the perfect steampunk touch as seen on the Broadway production. 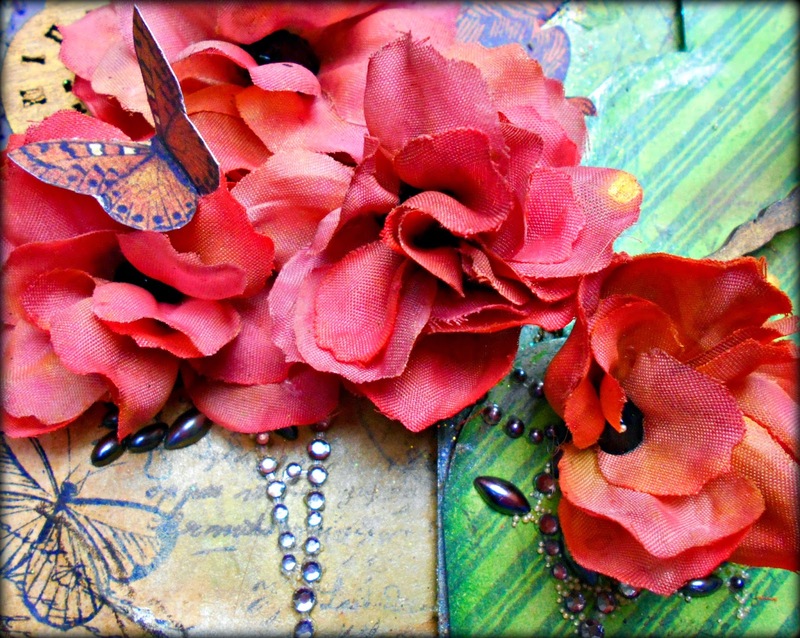 The poppies were created using petals from the Swirlydoo June Flower Add-on. I misted them with Heidi Swapp ink in Primrose until I achieved the desired poppy color. I layered and offset them before hot-gluing them together. The black centers were created with black puffy paint. My stems are Prima crystals from my stash. We couldn't find the perfect hat so I altered this Harja Flower Chipboard by embellishing it with purple microbeads and a green bling piece. At the top of that picture you can see the town clock created with more of the Watch parts. Lastly,where would the Witch of the West be without a broom? This one was made by hot gluing Rub n' Buffed dollar store sprays to a body of the Dragonfly Chipboard. Thanks for taking the time to peek at my project! Thank you to Altered Pages for their generosity! This is also my last Design Team Project with Leaky Shed Studios as my term has ended. I can't say enough great things about the generous owners,the talented DT and the fabulous quality of the Leaky Shed Studio Chipboard. Thank you so much for the opportunity and the fun! Thank you for giving me your link from FB. I love your art! I love inspiration from others! Well, cool beans, girlfriend! I love when you can totally have fun with a project .. like creating the hat and the broom! Awesome! Tracey, your stint as Swirly designer has been so inspiring, thanks for that and for all of your tips, your tricks and your gorgeous, gorgeous projects!!! Ahhhhhh! I love that song from Wicked! 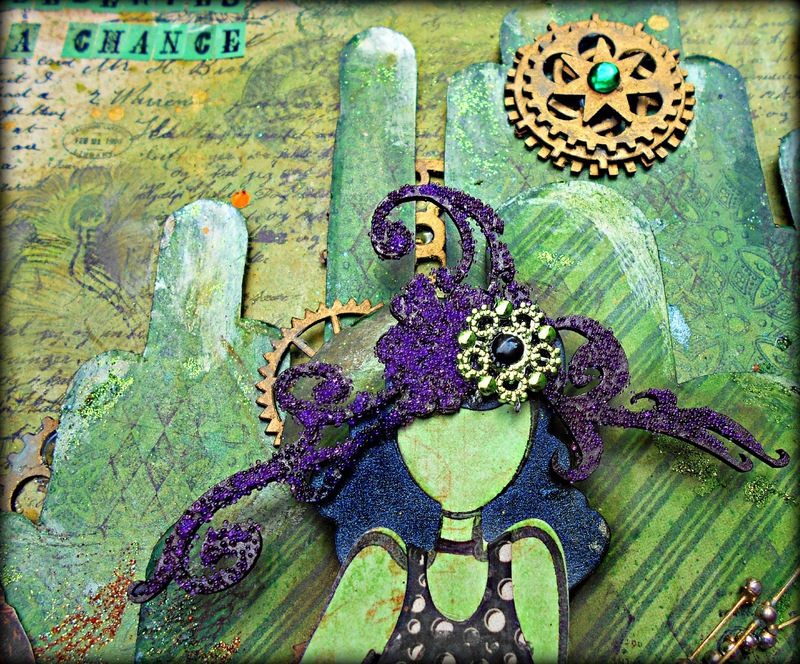 And your mixed media canvas is awesome, amazing, and so creative! I LOVE it, Tracey! Thank you so much for sharing your talents with all of us!!!!! You made me smile today!